Oh my goodness. This is serious. Or it’s serious, if Eleanor is telling the truth. If she’s not, it’s still serious, because Larry and the gang won’t be happy. Looks like Larry and Stephanie have a lot of work ahead of them. And not only the work you think they have. You’ll see. ……………..And the shoe (bombshell) finally dropped. Since I’ve had more time to go back to this today, I have to say that these last few pages have had some of the best artwork I’ve seen you do Charlie. The silhouette of Robespierre holding the flower, the external view of Building 7 and the comforting going on between Amy, Stephanie and ‘The Wee Fella’ all just superb and all too easy to miss against the dialogue and story. Thanks, Mike. 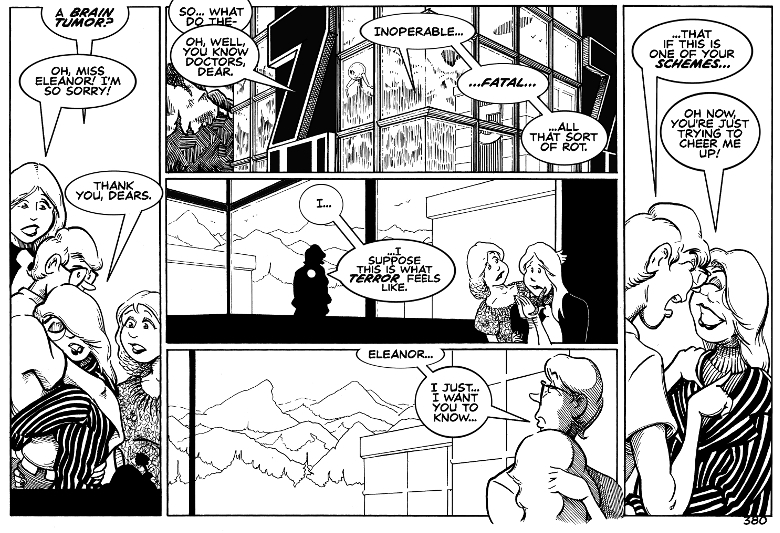 I admit, I’m inordinately fond of how panel 2 came out. It’s all simple perspective, but when it works, it’s fun. Plus, I had a lot of dialogue, broken up into pieces, and an exterior shot works beautifully in those cases. And three just came to me while I was walking the dog. You’re right-classic Eleanor. Anybody else would be offended, but she’s flattered that Larry would think she’d go to such lengths. …seriously the last thing I ever expected. I guess now we know why she wanted to become a vampire. Then again, she probably wouldn’t object to being one in the first place. I’ll say. Eternal youth, and the chance to wield even more power over her fellow man. There’s no way she’d turn that down. Plus being a vampire would save her a ton on personnel and equipment costs. True. You only need someone who can watch over things in the daytime. Someone you can trust. But, here’s a thought: What if you have a brain tumor when you become a vampire? Do you then have it for all eternity? Is the idea that becoming a vampire cures you of everything just a myth? An interesting point, but considering Eleanor is still functioning normally (that we can see), if becoming a vampire fails to eradicate the tumor, it would at least prevent it from harming her further. If vampires work in this world like they traditionally do, then Eleanor would be undead and her body would neither decay nor produce new living tissue, thus turning the malignant tumor into a benign one. If she becomes a vampire now, the tumor might remain where it is, but she won’t feel any ill effects from it and the cancer will not spread. That’s just my theory, though. I think you’re right-the tumor wouldn’t get any worse. It would still be there, because it’s a part of her (it’s not like an outside parasite). But, what if the tumor is already affecting her? It’s possible that it could be affecting her, but so far she seems more or less like her usual self, emotional vulnerability notwithstanding. Of course, you’re the one writing the story, so really, all I can do is make crazy guesses and wait for the next update. Shucky-darn. You’ll see how accurate your crazy guesses are with the next strip. LOVE this strip’s last panel. Notary Sojac! Long time no hear! Glad the Toonerville Trolley came by! Let’s make this a regular stop! Richie, as an old D&D player, I thank you sincerely. The trolley has been stopping here regularly, Charlie. I’ve just been quietly enjoying the views. Work has been keeping me 200% occupied – we’re relocating to a smaller part of the building and I’m supposed to be selling off all the cafe, kitchen, office and fitness equipment that won’t fit by next Sunday. Oh, and put together two new websites. And design a new logotype. And make the new marketing collaterals, and get the new exterior signs made….so a rumoured brain tumor kinda puts things in perspective. Wow. And I thought my life was busy! I like the touch in the silhouette in the third frame. Eleanor’s glasses? Yep. I love making a silhouette of someone, and just showing the glasses, or the eyes behind the glasses. Heavy turn to the plot. I’m on the edge of my seat! That’s part of Eleanor’s power. People say things that would be terrible to regular folks, and, since it’s usually true, she turns it around and takes it as a compliment. Oh, and sit back in your seat and fasten your seatbelts. I second the appreciative comments regarding your art. A lot of people who never look at web-comics don’t really understand the range of quality you can find in both the writing and the craftsmanship. As far as I’m concerned, you hit top-notch in both. Not just the quality of the drawing – which is excellent – but the design of the drawing – the little touches of background depth that turn your pages into artwork. Thank you for your kind words on the writing and artwork. I feel like I’m getting my “mojo” back. It’s still a struggle, but it’s looking better. Oh Eleanor. Being so typically Eleanor. You’ve dropped a terrible bombshell, Charlie–I’m quite devastated. But you’ve nailed the character reactions so well here, that I can’t even be mad with you. I’m sorry if you’re mad at me, mj. On the other hand, I’m flattered. It just shows you care. And it’s not like you haven’t upset your readers by killing off beloved characters, you know. First Archie and now this! Who’s next, Snoopy? Oh wait, he’s a zombie already, never mind. Holy Headaches! Quick to the Bat Discombobulatron, Robin! Well, so I was wrong about Eleanor not taking the hug. I do so like Larry’s last panel question, tho. Maybe now, we find out about Vicki!!! I believe we may learn more about Eleanor’s elusive sister in the future. Given the pace at which Groovy, Kinda moves, it may take a while. In the meantime, you can always re-read “The Importance of Being Eleanor,” for a look at The Famous Supermodel Victoria. Well, if ordinary brain surgeons can’t, I suppose it would make sense to seek the help of a research group for mad science. Because they can-if it all goes right-get to a world where extraordinary brain surgeons can help. Chair- I’m not sure how I didn’t find this site sooner. Your character designs a very interesting. A bit cartoonish, but not overly exaggerated, and also your line-work is gorgeous. Love the hatching! Oh hey, welcome to the Groovy, Kinda world, C.A! Thank you for those kind words. I love old fashioned pen and ink. For those of you who don’t know, C.A. is an Underdog Extrodinaire-creator of TDUGN: The Drako Universe Graphic Novel, a stunning piece of work that you really should check out. Beautiful and moody, with really nicely defined characters in a world you haven’t ever seen before. But wait, there’s more: C.A. has also created The Webcomics Index averitable treasure trove of great reading. Wow, you have quite an archive! I regret I can’t read every strip before the game round is over, especially at a plot point like this. I love your very clean linework and different methods of shading. I even saw some stippling, which was a nice surprise, as it can be so time consuming, but the effect is great. hbar-thank you. I’ve loved stippling ever since I got turned on to it (as opposed to screen shading) way back when. And take your time-you can read the entire archive (!) whenever you have the time. Speaking of reading, hbar is the creator of the very cool Barn-Megaparsec, a really nice sci-fi comic that’s just getting underway. Head on over! Well, I have the best friends money can buy. Seriously though, thank you, Tru. I’m very proud of the Groovy, Kinda community. I have never had to delete or even edit a comment in almost 380 strips. Without exception, you, you, and especially you, have been supportive, understanding, and patient. When you’ve disagreed or had strong opinions, you’ve always behaved like adults. There aren’t many comics with as many commenters who can say the same. To me, the Groovy, Kinda experience is everything: the strips, my comments, and your comments as well. The first thing I do when I fire up the computer is look to see if you’ve written something new. I feel very fortunate in sharing Groovy, Kinda with so many other fine creators. While you’re all great, there’s just something special about hearing from someone who creates one of your favorite comics. Aw, what can I say? You’re the best!